Making the sometimes fondly referred to as idiot cords has also been referred to as spool knitting, corking, French knitting or tomboy knitting. When using a knitting machine the the standard for knitting cords is to operate the carriage so that it knits in one direction, slips in the opposite. Using the e wrap method cast on 3or 4 stitches. Push in the part button on the same side the knit carriage is on ie. if it is on right, push in right part button. 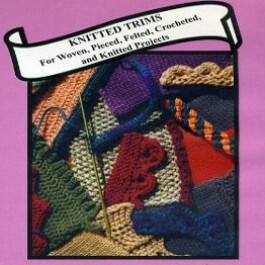 Stitches will knit from right to left, slip from left to right creating a float. Since the float is added yarn when knitting is pulled to set it, the gauge on the few stitches will be altered, so it is usually recommended that tension be tightened 1-2 numbers lower than garment tension. The float issue becomes problematic if cording is required that is wider than 4 stitches. Switching to tubular knitting using the ribber will produce tubes of any desired width. In Japanese machines the ribber knits tighter than main bed, if gauge matters a starting point is to loosen ribber tension by approximately 2 numbers. Larger cords tend to flatten, so if a round tube is desired stuffing may be required in the form of cording, plastic tubing that may be joined using appropriate caps from hardware or even pet supply stores, and a range of wires if the intent is to create sculptural forms. One exception to tightening the tension when knitting cords is when/if if they are joined to knit edges in the seam as you knit method. with five stitches the floats could be latched up creating a rib stitch. This same operation in tighter or smaller cords may make them swirl. If a flatter cord will serve the purpose, an alternative is to have the center stitch knitting on the slip rows. One may accomplish this by hand selecting needles or using a card. This will seal the tube in the center or periodically across the knit. The punchcard may be locked on any single row with the appropriate holes punched, and the position planned on the needle bed for knitting. The carriage will knit all stitches in one direction, slip/skip all but the stitches where needles are selected in the opposite. Floats may become design elements in some instances; if sewing onto another piece or hanging onto the knit as it progresses they serve as guidelines for doing so. If they are to be applied vertically to a garment, create a ladder to mark your sewing line. If you are a gadget collector “hand Knitting cord machines” may make them up to 6 stitches in width with the ease of cranking a handle and with a bit of planning wire beaded tubes may be produced on them as well. Some examples are from Bond, Prym, Wyr for knitting metal mesh, and eons ago some companies including Passap and Singer offered their own automatic cord knitters as well. 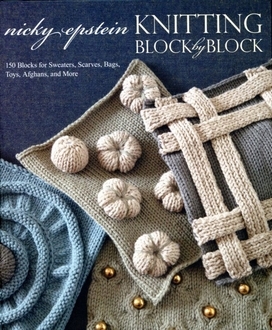 A recently published hand-knitting book has many ideas for applied i_cords that could also be used on the machine. For speed and simplicity, sometimes flat strips of knitting may be substituted for cords in some designs. Cords or strips may be used to create mock cables, add color interest, as trims, or in the bodies of sweaters or sweater edges. They may be braided, twisted, macraméd etc. Erica Patberg article in Knitter’s Magazine #104, Fall 2011. She can be found on ravelry. Cords and strips may be used as trims. Long ago versions were published by teachers in the seminar circuits, one may may be found at 1. 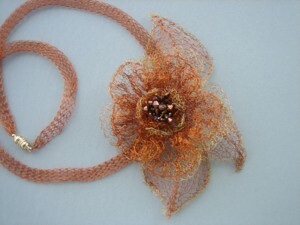 Ginger Luters is well known to hand knitters for her books such as her “Module Magic”. Apparently she also has published a book on trims,now available on DVD online that from cover photo appears to include some suited for this topic. A page that gives a bit of history and illustrations of spool knitters for crafts/ hand knitting may be found at Hub Pages, and on “circular knitting machines” at How to get what you want. A curly cord version may be found at Techknitting. More ideas and a knitter at Bond America. And lastly, something to make with those Barbie Knitters.